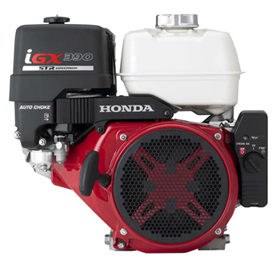 It may be Honda’s most advanced small engine, but that doesn’t mean the iGX390 is hard to work on. Here what you need to know about maintaining this engine so it continues to deliver top-level performance and reliability no matter what it may be powering. Oil: Check before each use. Change after the first month or 20 hours of operation, then every 6 months or 100 hours. Air filter: Check before each use, clean every three months or 50 hours, and replace the paper filter element every year or 300 hours. Spark plug: Check every 6 months or 100 hours, and replace every year or 300 hours. Spark arrester: If equipped, clean every 6 months or 100 hours. Sediment cup: Clean every 6 months or 100 hours. Fuel tube: Check every two years and replace as needed. Honda also recommends taking this engine into a dealer once each year to take care of more difficult tasks like checking valve clearance and cleaning the fuel system. The location of some components is different between standard and low profile designs. Standard iGX390s have a fuel tank on top of the engine, while low profile engines use a side-mounted or remote fuel tank. Oil Alert will shut down the engine if the oil level gets too low. If your engine has an hour meter, an indicator light on the controls will turn on when the system is triggered and the ignition is in the “ON” position. If your engine doesn’t have an hour meter, the indicator light will blink when the engine stops or you try to start it. The dipstick is built into the oil filler cap, while the drain plug is below and to the left of this cap. When checking the oil level, do not screw the cap into the filler neck. Always use a new washer with the drain plug when changing the oil. Both versions of this engine hold 1.2 quarts of oil. 10W30 motor oil is recommended for all temperatures. Standard engines have an airbox located next to the muffler. To access the air filter, remove the nut on top of the air box, followed by the box itself. Remove a second wing nut and slide off the foam and paper filter elements. On low profile engines, the airbox is next to the recoil starter. To access the foam filter element, squeeze on the tabs on the cover and swing it to the left. To clean a paper filter, knock it against a hard surface or use compressed air under 30 psi to push away surface dirt. To clean a foam filter, wash it in warm, soapy water or a nonflammable solvent. Once dry, soak the filter in clean engine oil and squeeze out any excess. This cup uses gravity to collect dirt in the fuel before it can reach the carburetor jets. 2. Unscrew the sediment cup from the bottom of the carburetor. It should come off with an o-ring and a filter. If you have a low profile engine, you’ll need to take off some parts to access the cup: Remove the air filter cover and foam filter element, then unscrew the 5 bolts and 6 nuts holding the airbox to the carburetor. 4. Wash the cup with non-flammable solvent and allow it to dry. 5. Reinstall the cup in reverse order, using a new O-ring and lining up the tab on the filter with the tab on the cup. The plug is located between the muffler and the fuel tank. Disconnect the spark plug cap, then use a 13/16 inch plug wrench to remove the plug. The plug gap should be between 0.7-0.8 mm. The arrester is optional and can be fitted to any iGX390. If you have a standard engine, you’ll need to remove the air box to get access to all of the muffler protector screws. 1. Remove the screws from the muffler protector. There are two 5 mm screws on the right side, two 5 mm screws on the top, and one 6 mm screw on the left side. 2. Remove the two 5 mm screws holding the spark arrester inside the muffler opening. 3. Clean the arrester with a wire brush. 4. Reassemble in reverse order. Need Something for Your Honda Engine? From drain plug washers to major components, if it’s for a Honda, you can get it from www.hondalawnparts.com. As an authorized Honda Engines dealer, we’re able to offer a wide selection of OEM parts, and we can ship those parts to any address in the U.S. or Canada. Not sure what you’re looking for? Our site can filter results by your model and serial number, and it has built-in parts diagrams and factory descriptions so you can find what you need quickly and easily.